The Apple iPad air brings a gorgeous 9.7-inch 2048-by-1536 resolution, A7 chip with 64-bit architecture and M7 motion coprocessor, 1080p HD video recording, Up to 10 hours of surfing the web on Wi-Fi, watching video, or listening to music, etc. From the above information, we find that the new iPad Air with stunning features. Well, if you are a Blu-ray movie fan, playing Blu-ray movies on iPad Air a will be really a nice choice. If you are one of them, go through the page. As we know, the iPad Air video format is limited to MP4, MOV and MOV. And this if you want to add Blu-ray movie to iPad Air, you need to rip and convert Blu-ray movie to iPad Air compatible video format. You can get this easy-to-use Blu-ray to iPad Air Converter to help you do the conversion task. This is the top Blu-ray ripper for iPad air that can help you to rip and convert Blu-ray to H.264 MP4, the best format for iPad air at super fast speed with the best output. Step 1: Import Blu-ray movie to the best Blu-ray to iPad Air Converter. Launch the best Blu-ray to iPad air Converter. Click the button like a disc to load DVD movie to it. If necessary, you can have a preview of your movie. Tip: Freely select the subtitles for you Blu-ray movies from the “Subtitles” option. Thus, you can transfer and play Blu-ray movie on iPad Air with preferred subtitles. Step 2: Select an output format for iPad Air and set the output folder. Click on the dropdown menu of “Profile” and then move your pointer to “Apple iPad”> iPad Air H.264 HD Video (*.mp4)” which is best video format to transfer Blu-ray movie to iPad Air. Then set the output folder by clicking “Browse” icon as you need. Step 3: Click “Settings” icon to make the best video settings for iPad Air. Click the “Settings” icon and you will go into a new interface named “Profile Settings”. 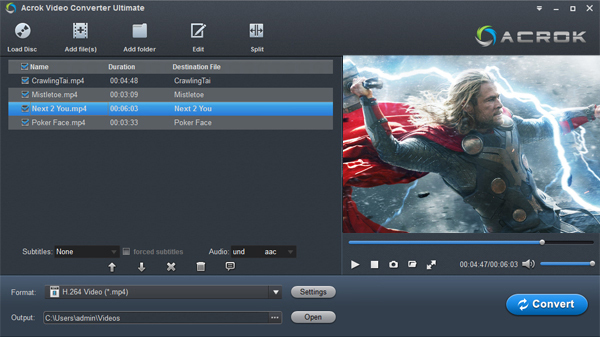 You can adjust codec, aspect ratio, bit rate, frame rate, sample rate and audio channel to optimize the output file quality. Note: Since the native Blu-ray movie resolution is 1920*1080; thus, set the video size as 1920*1080 is enough. Step 4: Start to rip and convert Blu-ray movie to iPad Air H.264 MP4 format. Click the “Convert” button; it will rip Blu-ray movie to MP4 for iPad Air immediately with CUDA/AMD acceleration technology support. You can find the process in the “Conversion” interface. Once the Blu-ray to iPad Air conversion on is done, you can find the output file for iPad air effortlessly. Now you are able to transfer Blu-ray movie to iPad Air via iTunes for enjoyment freely. How to play MKV, AVI, WMV etc movies on iPad Air? 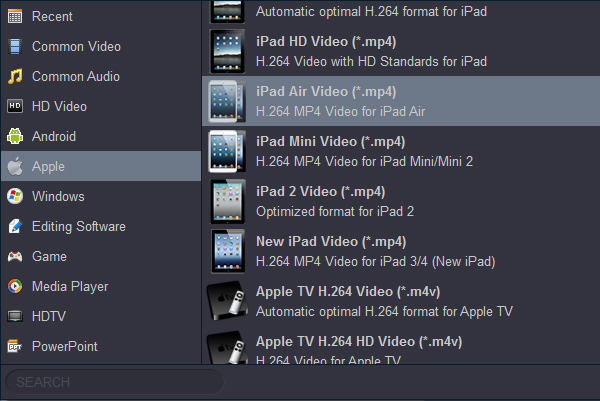 iPad Air Video Converter can help you convert any video format.